Smart Elbow® deflection elbow has solved the problem of frequent plug-ups in pipes conveying abrasive material. Old ceramic, refractory-type elbow is shown above. 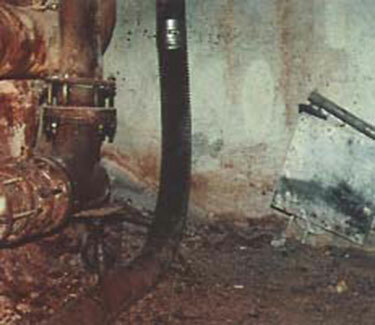 Material blown out from frequent plug-ups can still be seen on the floor and pipes. Flow characteristics of Smart Elbow deflection elbow prevent plugging. Clogging was a major problem in transferring abrasive material in a fiberglass process. 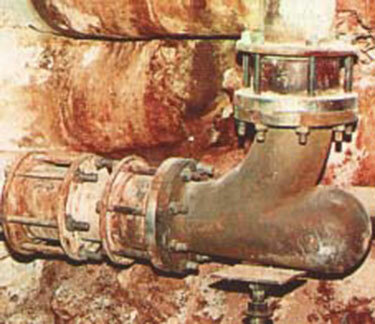 The resulting operating inefficiencies were ended with a new type of piping elbow. Fiberglass is produced in an automated process at Fiberglas Canada's plant in Scarborough, Ontario. The process starts with six ingredients, the main ones being sand, borax, soda ash and limestone. After they are weighed automatically in hoppers at the bottom of batch storage silos, the ingredients drop into a transfer vessel/mixer. The batch is mixed by six to eight pulses of air, a valve at the bottom of the vessel opens and the material flows into a pneumatic transfer pipe. The batch is then pneumatically conveyed from the batch house through a series of five-inch pipes. The pipe stretches about 200 feet horizontally, turns a right angle and reaches a vertical length of 120 feet, then turns another 60 feet horizontally. Conveyed at a rate of 6,000 kilograms an hour under 15 psi of transfer pressure, the batch ends up in storage silos in the plant's furnace hall. Each batch takes about two days to sift through the silo before being automatically fed into the furnace. The ingredients are melted into glass, then the glass is spun through fiberizers and is formed into fiberglass. A total of 144,000 kilograms a day of fiberglass is produced in the plant. Piping elbows are needed at the two turns in the conveying pipes which connect the batch house and the furnace hall. Until June 1984, ceramic refractory-type elbows were used. Dave Goodwin, Plant Maintenance Superintendent, says the elbows resembled cornerstones: ten-inch cubes with five-inch-diameter holes at 90-degree angles. The elbows were held within fabricated steel boxes. Problems with the refractory elbows were two-fold. 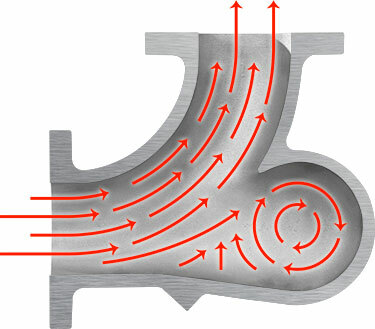 A minimal amount of wear on the elbows created plugging, particularly at the section of horizontal pipe leading into the first elbow. The elbows were regularly changed after plugging up about six times. The material being conveyed was so abrasive that the changes averaged three times a year for the first elbow and twice a year for the second one. Goodwin points out that the elbows cost about $350 U.S., so each one had an annual cost factor of approximately $1,000 U.S. This was in addition to the aggravation of blowing out twelve to twenty plug-ups a year and the time spent in changing the elbows. The plug-ups caused even more serious problems. Because the plant is automated, plugs in the pipe could go unnoticed. When there was a delay in discovering a plug, batch levels in the furnace-hall storage silos would get low and the individual ingredients would begin to segregate. This type of batch upset would not be detected until the fiberglass emerged from the furnace some two days after the ingredients had segregated. Then, as Goodwin explains, "Whenever there is a batch upset, our operators must adjust the process controls to allow for the upset. Once the upset batch is cleared and the mix is back to normal, they have to readjust all the controls. When the cause was a plugged pipe, the two-day delay meant that our operators would be trying to adjust to a problem that was already gone." The problem caused by frequent batch upsets did not result in poor-quality fiberglass because the process was adjusted to ensure the right insulation values were attained. Instead, good operating efficiencies were suffering. According to Goodwin, that was the main problem with the elbow. "There is always something we can do to ensure we get the right quality, but we might have to do it by sacrificing good efficiency, and that's not good business." As a result, the company decided to try a new type of piping elbow. The Smart Elbow® deflection elbow from HammerTek Corp., which is specially designed to minimize flow turbulence, plugging and product degradation, was chosen and installed in June 1984. Only the first of the two refractory elbows was replaced at that time. The new elbow functioned without any problems until September 1985. The line began to plug at the lower horizontal join, so the elbow was removed and examined. The point separating the vortex chamber from the rest of the pipe was worn right off, so the elbow was replaced. The new elbow cost $800 U.S. and considering its fifteen-month lifespan, the costs work out to be less than the old elbows. In addition, the particular operating inefficiency is no longer a problem. An elbow for the second location has been ordered and will be installed in January 1986. The old elbow in this location has caused fewer problems than the other, but is in an awkward location and is difficult to change. Goodwin says he is expecting the same level of success from this elbow as with the first elbow.